I used to love reading challenges but I stopped participating in them a while back and I hadn’t found one intriguing enough to get me back into them… until now. Jessticulates shared about a Harry Potter themed readathon hosted by Gi @ Book Roast for the entire month of April and as soon as I read about it, I knew I had to participate. Gi has created one of the most creative reading challenges I’ve seen yet and it certainly doesn’t hurt things that it’s Harry Potter related. Based off the O.W.Ls (Ordinary Wizarding Levels) from the stories, this readathon will be held April 1-30th where reading a book related to each “class” will earn you a grade. In addition to trying to achieve as many “O’s” as possible, you can take this challenge to the next level using the Wizarding Career guide that Gi put together. Each career shows you which OWLs you need a passing grade for, so because I picked Librarian as my career choice, I need passing grades in five classes but I’m still going to shoot for all 12 OWLs because I’m ambitious insane. I’ve been heading for a major reading slump for a while now (my last 4-star read was 3 DNFs and 16 complete books ago) so I’m hoping I’ve picked some great reads and that this successfully gets me back on track. Without further ado, here are the books I’ve selected to read for my O.W.L.’s! Well, not quite yet, but soon. 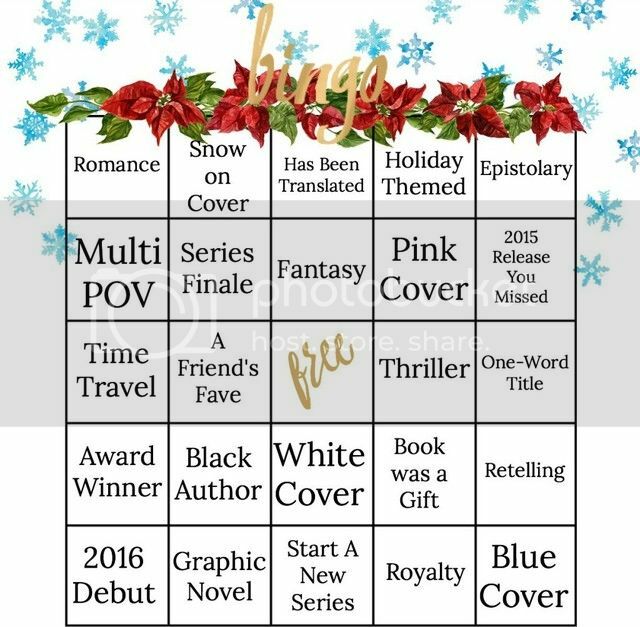 Until then, we can be excited about the new Holiday Bingo Card! This is quite possibly my favorite bingo card to date. My whole goal lately has been to get my review stack down to a manageable size, and I have, but I’d really like to get it down to the single digits or even knock it out completely. So, almost all of the review books I have left? I’ve applied to bingo squares in hopes I can stick with it so I can meet that goal. Fingers crossed. 🙂 Bold and underline are my review books in case you wanted to know. And yeah, I haven’t QUITE decided on my graphic novel. Figured I’d pick one up from the library when I feel the urge. This officially marks the end of my experiment and I gotta tell you, it was a ton of fun. None of these books were on my TBR but pushing myself outside of my comfort zone and reading those stories that I normally wouldn’t was quite an eye-opening experience. If you missed any of them, here are the links to my reviews for each book. The first Finalist I picked up was Challenger Deep by Neal Shusterman. I adored Unwind by this author and while this one is completely different, oh, this story quite blew me away. This is the story of a fifteen year old boy who is suffering from schizophrenia and is struggling to live a normal life before getting treatment. An incredibly heartfelt story that the author brings to life based on his own son’s experiences with mental illness. It was part fantasy and melancholy and I truly loved this story. What I loved most was the honesty (and the lack of a romance to make mental illness all okay like most stories of this ilk). Extremely well-written and completely captivating. Middle Grade novel and is actually the authors debut. It’s the story of Suzy Swanson who loses her best friend, twice. The first time she loses her is to the group of popular girls at school when Suzy fails to change her quirky ways and the second time is when she dies from drowning while on vacation. This one wasn’t on my TBR because kids books that deal with death are typically the most heartbreaking. I loved the portrayal of this one with its positive message and Suzy’s character is definitely one to admire. Up next was the graphic novel Nimona by Noelle Stevenson. I hadn’t heard much of anything about this story despite the fact that it was apparently a well-loved web comic before it was published this past May. I’m a recent convert to graphic novels so I was eager to pick this one up after it got declared an NBA Finalist. I can’t say that I particularly see why it was nominated though. It was entertaining and made me laugh but it didn’t necessarily have the impact on me that the other reads already had. I do love seeing graphic novels being given the spotlight more and more these days though. one point but apparently didn’t survive one of my infamous shelf purges. I’m a huge fan of magical realism though so I can’t quite recall why I gave it the boot. 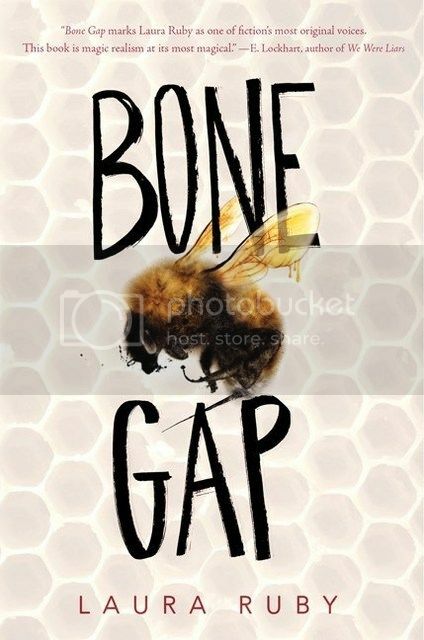 Bone Gap was easily one of the most unusual and unconventional reads I’d read this year… possibly ever. I didn’t realize until halfway through when I was reading an interview with the author that this is in part based on the Persephone myth which made me more intrigued in the book than I was before. Very mysterious with some rocky world-building but still an impressive enough story in my opinion. I saved the most daunting read for last, and ironically enough it ended up being one of my favorites. Most Dangerous: Daniel Ellsberg and the Secret History of the Vietnam War by Steve Sheinkin, as the title proclaims, is a story about the history of the Vietnam War. I saved it for last because, eeek, Non-Fiction. Except! It’s written in such an awesome way, I could have mistaken it for one of my typical mystery thrillers. This marks the third time that Steve Sheinkin has been a Finalist: in 2012 for Bomb: The Race to Build―and Steal―the World’s Most Dangerous Weapon and in 2014 for The Port Chicago 50. Third times a charm? I suppose we shall see. It’s not like I’m actually picking the winner, I could be completely wrong but this still feels like a huge decision. I’ve spent the last month or so reading these stories and I’m so excited to find out who’s going to be taking home this incredible honor. Having read all of the Finalists and experiencing the stories makes me feel more invested in the outcome. But, I suppose the whole point to this was to make an actual decision. It’s so hard to really differentiate between the stories because they’re all so incredibly different. 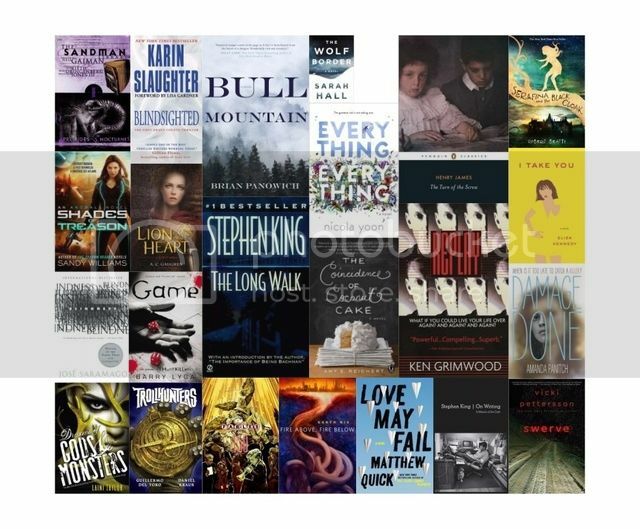 Mental Illness, Death, Fantasy, Magical Realism/Mythology, and Non-Fiction. They’re all in a category of their own so judging them all grouped together like that is a bit daunting. In terms of overall impressiveness, it boils down to two: Most Dangerous by Steve Sheinkin and Challenger Deep by Neal Shusterman. I gave both of these stories 4.5 stars but for different reasons. Most Dangerous was an incredibly thrilling portrayal of a real-life event and Sheinkin’s research was impeccable. Challenger Deep was an amazing yet heartrending adventure into the mysteries of mental illness. I’ve read several stories about mental illness before and none affected me quite like this one did. If I had it my way, Challenger Deep would win the National Book Award. The uniqueness in the portrayal was immensely moving and it couldn’t have been a more authentically felt depiction. It wasn’t emotionally devastating just because that’s what one would expect, it wasn’t a story that started off about mental illness only to be sideswiped by a romance that came out of left field, and it wasn’t given an unreasonable happy-ending. It was sincere and genuine with artwork that only added to its appeal. So there you have it! That’s my pick at least. 🙂 Be sure to check out the National Book Award site tomorrow (November 18th) for the actual winner. The National Book Awards shortlist has been announced and I’m once again impressed with the variety in selections. Book award nominations always generate interest in books but the NBA’s have always been the most interesting to me (vs. The Booker). For years I have wanted to cut out some time to devote to reading the nominee’s prior to the winners are announced in an attempt to not only understand what the judges are seeing but to make my own half-hazard guess as to who is most worthy of the win. I haven’t actually read a single one of the finalists yet but I’ve decided to finally attempt this little experiment this year for the Young People’s Literature category. 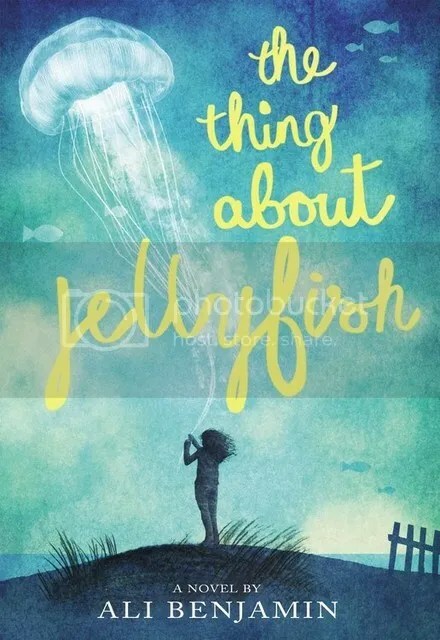 A young girl struggles to deal with her grief after the death of her best friend so she begins researching a rare jellyfish she believes is responsible for her friends death. A magical realism tale of a boy in a small town who witnesses an abduction but is unable to keep his facts straight because of his inability to differentiate between faces. A non-fiction story about Daniel Ellsberg, the individual responsible for leaking secret documents during the Vietnam War. A story about a young boy with schizophrenia and the mental adventures his illness takes him on. And a fantasy graphic novel about shapeshifters and villains with romance and humor. Winner’s are announced November 18th so I’ve got a little over a month to read these five titles. Have you read any of these already? Who do you think is most worthy of the win? Yep, it’s time for another bingo card! Some really excellent squares and it’s oh, so pretty too. Interested in joining in? Head on over to Pretty Deadly Reviews to sign up now! Bekka lists out the rules and offers some picks for those tougher squares. I had a hard time making my pick for Religious Minority MC (I picked Rumble — I believe Atheism should work), Animal on the Cover (Watership Down because seriously, I hate telling people I haven’t read that) and a Book About Dreams (Requiem for a Dream because it’s the only one that came to mind first). A Book About Dreams Requiem for a Dream by Hubert Selby Jr. The best thing about doing a Bingo Wrap-Up is knowing that a new Bingo card is soon coming. I finished this card super early, finishing my last book on August 11th. I couldn’t believe how LOST I was in picking new reads because I didn’t have to check to see if it applied to a Bingo square. Bingo has become quite a bit of an obsession for me but I do love it so. If you haven’t joined in, you should give it a whirl, it’s a ton of fun. What happened to Spring Bookish Bingo, you say? Well, I’m switching it up. I’ve decided to scratch the last Bingo card and start on the Summer Bingo card instead. Two reasons: 1. I was honestly a bit behind in that card and the last month would have been a struggle to complete. 2. Most of the squares I had left to fill couldn’t be filled by review books and I’d much rather be able to do bingo AND work on my review mountain. So that’s that! I’m really loving the new card though and while I struggled finding picks for a few squares, I was able to apply TWENTY review books! I’m feeling pretty good about my picks (although I always say this and always end up switching things up). So, here is the new (and can I say beautiful) Summer Bingo card! 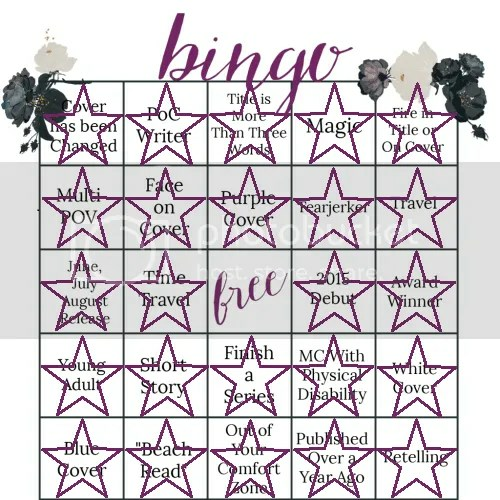 I’m sure this goes without saying at this point, but there’s not much that I go crazy about more than Bookish Bingo. So, the last card I kind of blew because sucky things in life got in the way but I’m back! And even though this card is crazy hard and took me days to come up with picks, I’m doing it. I tried to incorporate as many review books into my picks so I don’t fall completely off track but I’m feel pretty good about my picks and hope I can stick to it. Are you participating? You should. It’s a blast. 🙂 Sign up here! There had been talk of not doing another Bingo card until March but thankfully that didn’t happen. I think it’s quite possible I have developed a bingo addiction.